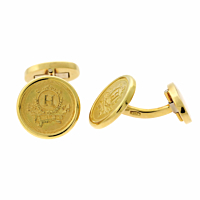 A handsome pair coin shaped Hermes cufflinks in 18k yellow gold. The center raised design, of the classic Hermes logo, is surrounded by tiny ridge detail and a smooth, round edge. The posterior of the pair contains a solid 18k yellow gold classic cufflink, twist element.